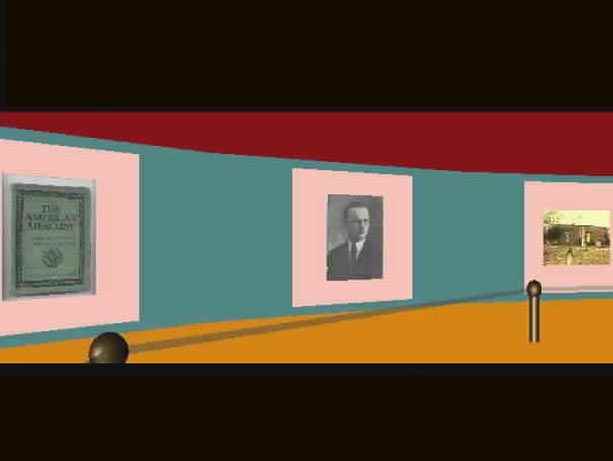 This gallery, unlike the main gallery, is for those who desire a quick tour or a "three-dimensional" gadget-glance at the big picture before entering the main gallery. You will need a VRML ("virtual-reality machine") viewer, free from a number of resources, before you can view this part of the gallery in "three-dimensional" quality. (Obtain the VRML viewer at: http://www.trivista.com/vrml/. Windows XP users, go to Cortona.) You may, however, see the gallery in two-dimensional thumbnail sheets, enlargeable by a mouse click, even if you do not have a VRML viewer and do not wish to take the time to download it--about 12 minutes with a 56 kbs modem. Once inside this part of the gallery, you will be confronted with a series of images conforming to an oval picture gallery format. Use your mouse to navigate or your arrow buttons on your keyboard (recommended). For the mouse, click in the gallery rectangle and move up or down for zooming in or out and right or left to move around the oval. (The zooming function may not work on all touchpads and mice.) For using arrows, simply click the mouse in the rectangle and use the up and down arrows to zoom; right and left arrows to go likewise. Pictures are arranged to start from right to left. (Don't ask why; that is the way the program was configured--no doubt, by a southpaw.) There are 15 pictures in each of five different panoramic galleries, arranged similarly, though not exactly, to the main gallery. Click on the image you wish to enlarge. A separate browser window will open. Simply close it when done viewing each image and return to the browsing room in your main browser window. (The start image in the gallery is the logo of the software developer for the panoramic construct, TriVista®. If you click on that image, you will be transported to that company's site.) You also have the option of viewing the photos in "frames" (horizontally split windows--best suited to 17" screens as opposed to default opening of a new browser window for each photo). Be aware that once in frames, however, you cannot exit from them except via your browser back button, specific links designated in each frame, or by closing the browser and opening a new copy. The third option is to open the photographs in normal viewing, absent the panorama, from a thumbnail proofsheet format. For this option, either in fullscreen or frames, hit one of the "Proofsheet" buttons above or the "2D" link near the bottom of the "3D" pan pages,.. There are some photos here which are not in the main gallery and there is less biographical information and printed material than in the main, the emphasis here being on quick overview. The images featured in this part of the gallery may change from time to time so come back and visit again next year... Have a pleasant stroll. Sorry, but severe funding cuts have prevented us from supplying benches or concessions in the gallery; please bring your own sitting apparati, as well as all food and libations you may desire to consume. Alcohol, smoking, use of cameras, knives, forks, inappropriate language, spoons, camp stoves, demitasse cups, hosiery runs, and/or firearms in the gallery, however, are, naturally, strictly prohibited. Typewriters are encouraged.